Good family movies about animals make for entertaining ways to teach your kids about respecting wildlife, the intelligence of the animal kingdom and the joys (or responsibilities!) of having a pet. They’re also fun ways to incorporate other messages, like teamwork, standing up to bullies, and so much more. Think about it: movies with animals as a main star wouldn’t be so popular if they didn’t resonate so well with children! While there are hundreds upon thousands of good family movies about animals out there, a few stand out from the pack (pun intended!). Check out our favorites! Free Willy is a 1993 family drama movie that is followed by 3 sequels: Free Willy 2: The Adventure Home in 1995, Free Willy 3: The Rescue in 1997 and Free Willy: Escape from Pirate’s Cove in 2010. The movie features Jason James Richter, Lori Petty, Jayne Atkinson, August Schellenberg, Michael Madsen, Michael Ironside and Keiko the Orca Whale, as Willy. Willy gets caught in the net of some whalers and taken to a theme park. When a 12-year old boy, Jesse, is caught vandalizing the theme park, his social worker gets him to clean-up the mess he made at the theme park, where he bonds with Willy. Jesse teaches Willy to perform tricks, giving him a permanent job at the park. The park’s owner decides to have Willy and Jesse put on a show for visitors, which doesn’t turn out as expected. Jesse discovers that the park’s owner and is assistant are devising a plan to kill Willy and claim his insurance policy. Can Jesse move Willy out of the park and back to his home before anyone discovers him? Ratatouille is a 2007 computer animated comedy film that showcases the voices of Patton Oswalt, Lou Romano, Janeane Garofalo, Ian Holm, Brian Dennehy, Peter O’Toole, Brad Garrett and Peter Sohn. Remy is a rat who wants to be a chef but he runs into issues like the fact he is a rat and his parents don’t approve of his career choice. Remy makes friends with the garbage boy who works at the restaurant of his cooking hero. The two create a plan that will turn Paris’ culinary world completely upside down, while along the way Remy learns about the true meaning of family, friendship and going for his dreams. Beethoven is a 1992 family comedy movie that is the first of two theatrical releases in the Beethoven movie series, with the other being Beethoven’s 2nd in 1993. In addition, there were six other films in the series that were direct to video releases. The movie stars Charles Grodin, Bonnie Hunt, Deana Jones, Nicholle Tom, Christopher Castile and Sarah Rose Karr. Beethoven is a puppy adopted by the Newton family. Little did they know that he would turn into a huge St. Bernard that loves to make a mess. Everyone in the family adore Beethoven, except for dad George. 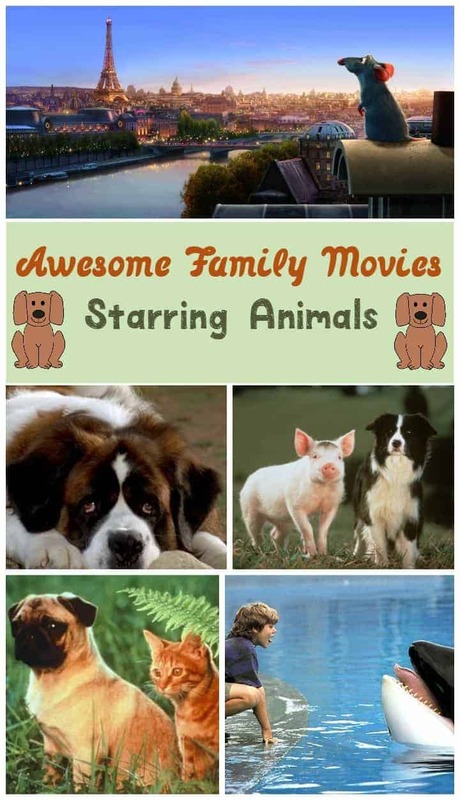 However, when the family finds out that a mean veterinarian wants to make Beethoven part of a horrible animal experiment, George is the only one that can save him. You’ll note the absence of giants such as Old Yeller and Marley & Me from this list. I left them off because, frankly, they made me cry for hours after the movie ended. Old Yeller in particular is pretty much the worst family movie in the history of family movies, if you ask me. Who thought that was a good idea for a children’s film? I’m still traumatized! While Marley & Me is a fabulous movie, the ending may be difficult for sensitive kids. Im a sucker for animal movies and grew up watching Beethoven on repeat! Ratatouille is such a good movie too. I always loved Homeward Bound when I was young! I haven’t seen those movies on a while but I certainly had a lot of fun watching them a couple of years ago! As a dog lover, I am a huge fan of Beethoven. His slobbery face is adorable, and I love large-sized dogs. I love Ratatouille and Babe. Ratatouille amazes me that anyone could make a rat seem lovable! And my family just watched Babe, which is just the cutest movie ever. We’ll have to check out the others! My kids love movies with animals in them. I totally forgot about Free Willy!! That one would really be a hit! Thanks for sharing your list! My daughter loves March of the Penguins. She’s seen it more than a dozen times. I loved all of these movies but my favorite animal movie is Milo & Otis. I love that movie so so much! Ratatouille was one of our favorites. Must have watched it a million times. I don’t blame you for leaving off Marley and Me. I haven’t watched it myself since I don’t want to cry. Aw yes I love Rio 1 and 2. It is such a heartwarming story about community and how working together as a team leads to a happy ending! We’ve seen all of these. And loved them. Especially Ratatouille. Love love ratatouille and our toddler can’t get enough of Madagascar! Thank you for this wonderful list! Ratatouille is my daughter’s favorite movie – she literally watches it once a week and has for years! i don’t think she will ever get tired of it. Oh my word. I haven’t watched some of these in such a long time. Adding them to our family watch list! I love your selection, animas are always the cutest!